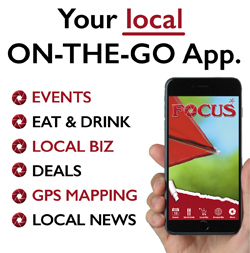 FOCUS considers press releases from legally registered not-for-profit organizations for publication. It also considers press releases for low-cost or free events, verifiable benefit events or events of a broad general appeal to the public. Ideally for us, just type the press release directly into an email using complete sentences. Or, you may send the release in a text or Word document. Just attach the text document to the email. Include the event name, date, time and location in the first paragraph. The following paragraphs should explain the speaker, featured performer, if any, and the purpose of the event, as well as any cost or deadline for registering and a contact name and email or phone number for the event. Generally, 500 words is more than enough to inform our readers. Please, no all caps words, bold face, bullets, italics, underlining or colored text. Attach images or logos to the email. Please don’t send only a flyer, we’re not able to help publicize your event from only a flyer. However, attach a flyer if it has images or a logo that you’d like included in the release if we are able to print it.